Young people – film buffs, emerging filmmakers, first time filmmakers – they are a pleasure to work with. They are energetic, intelligent, enthusiastic and willing to learn. They attend industry panels, network with filmmakers, and try to watch as many films as possible. Seeing them grow as artists, as filmmakers, and screen their films as they develop, is really heartwarming! 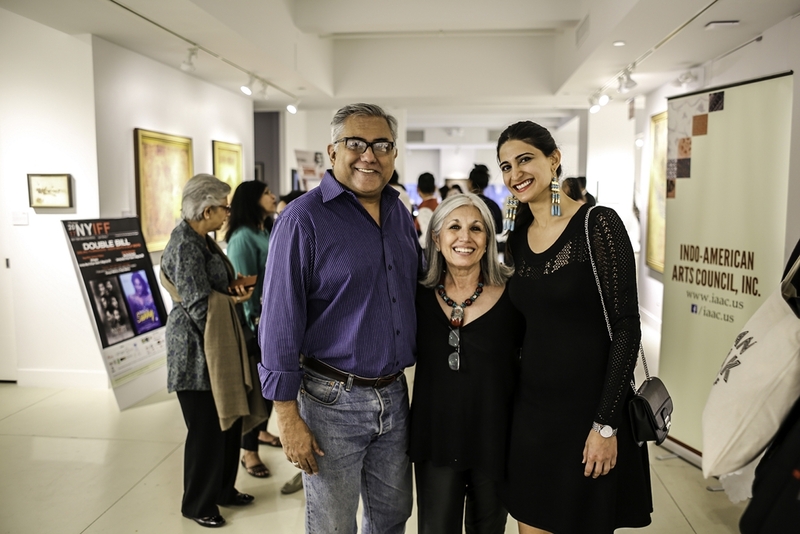 We begin our spotlight on the South Asian women at the 2017 edition of the New York Indian Film Festival by interviewing the Festival’s leading lady, Aroon Shivdasani, who provided insight into what moviegoers can expect this year at the annual event in New York City which celebrates the cultural diversity in filmmaking. J’AIPUR: How is this year’s festival different to those of previous years? Aroon: Bigger, better. We have 85 films over 8 days: a tribute to the late Om Puri, Mobile Bollywood, special events including sibling filmmakers [Anatomy of Violence by Deepa Mehta and Mostly Sunny by Dilip Mehta] and completely different bookend venues to previous years. J’AIPUR: What can people expect from this year’s films in terms of prominent themes? Aroon: Family, relationships, connections. We have several films dealing with these subjects and, coincidentally, we have two young men making their first films – and their fathers, Vishal Bhardwaj and Feroz Khan, are flying in especially to see their sons’ films. J’AIPUR: Out of the films that you chose, which film had the biggest impact on you and why? Aroon: Konkana Sen Sharma’s A Death in the Gunj is a story about the reality of families – perfect on the surface, turmoil beneath. It is also her directorial debut of a feature film that she wrote and directed based on a play. This film is our tribute to Om Puri. J’AIPUR: What approach have you taken to organizing this year’s NYIFF? Aroon: I don’t think it is too different from other years. We look for the best films – both submitted and scouted. We reach out to larger, more diverse audiences, and apply for funding to help us present the festival to the widest audience, with the best resources. This year has been more challenging than previous years because of unbelievably horrid fiscal constraints, but the show must go on and we’re passionate professionals. J’AIPUR: Have there been any unforeseen challenges along the way? J’AIPUR: Tell us about the thinking behind the selection of films this year. Aroon: It often reflects the mood of the time. This year, families, father-son relationships and women’s issues seem to dominate the themes. We look for good films that speak about realities in various genres. J’AIPUR: Can you provide a few examples of programming, including events, that somehow epitomize the spirit of this year’s festival? Aroon: This year the festival is giving filmmakers a lot of food for thought: industry panels about distribution and shooting in New York, a conversation about language films with David Taghioff of CAA, Shoot A Short Film workshop with National award winning filmmaker Umesh Kulkarni and, best of all, the Mayor’s Office of Media and Entertainment is publicizing our festival through social media. Our promo is in yellow cabs and our posters are on bus shelters and telephone kiosks. J’AIPUR: What’s your biggest fear during the festival? Aroon: Lack of funding is a constant source of anxiety. Another major fear is damaged film prints. We always ask for backup blu-rays. J’AIPUR: Leading up to the current year, what has been one of your favourite film discoveries as Festival Director? Aroon: Young people – film buffs, emerging filmmakers, first time filmmakers – they are a pleasure to work with. They are energetic, intelligent, enthusiastic and willing to learn. They attend industry panels, network with filmmakers, and try to watch as many films as possible. Seeing them grow as artists, as filmmakers, and screen their films as they develop, is really heartwarming! J’AIPUR: What advice do you have for filmgoers on navigating and getting the best out of this year’s festival? Aroon: Check the schedule, read the profiles, and view the films that appeal to you specifically. All the films have English subtitles so it won’t really matter what language they are in. Stay and listen to the post-screening discussions —they are fascinating and you will learn about the film, the screenplay, the thinking behind the making of the film.